Pulling out of our Fairfield, Iowa driveway at 7am on a cool, drizzly morning, I was filled with an appropriate mix of excitement and apprehension. After a year of pouring my heart and soul into designing and building a tiny house from scratch, our week-long tiny house move was just beginning. 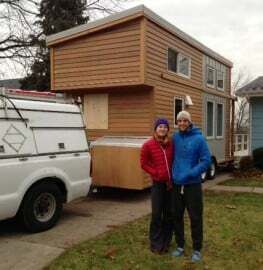 Now was the time to make this little house our real home – but to do this we had to get it half way across the country! Editor’s Note: This post is edited from an original version written for the Tiny House Magazine many months ago. It’s long, so will be broken up into two parts. Here she is on her maiden voyage! Day one began with my eyes so glued to my mirrors my neck started aching. I was checking and re-checking for clearance, judging my location within my lane and trying to avoid the narrow shoulders, anticipating and sometimes yelling obscenities at approaching cars, upcoming hills and hazards of all kinds. My head was spinning and my stomach tied in knots. I knew it would all work out but when the product of a year’s worth of labor – not to mention huge financial investment – is rolling down the road with seemingly no protection, well, it must feel about the same as if your child was rocketing down a high-speed luge track, strapped to the back of a first time racer. What had I gotten myself into? Bathroom break at a freeway rest stop on our first evening. We didn’t quite make our planned RV park before dark. 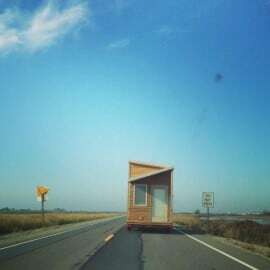 An oft-overlooked topic in the tiny house community is the process of moving a tiny house and especially long distance. Most people build very close to where they will be living. I, on the other hand, built my house on Iowa, and once finished, immediately towed it about 2300 miles to Northern California. Was this crazy? Probably, yes. But you know what? It worked. We made it safe, and the house made it through with little more than a scratch. Get windows with tempered glass just to be safe – they’ll be less likely to break during the bumps of travel, and less likely to cause injury if broken. Frame your house with plenty of wind-bracing to protect the house from shearing and distortion from wind shear as it’s towed at high speeds. 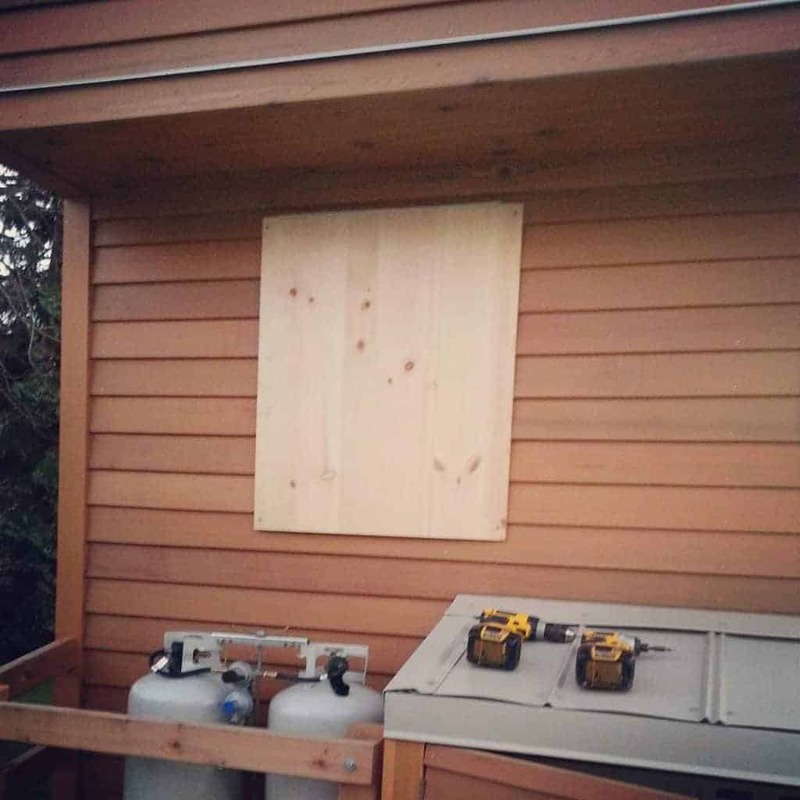 It would be a shame if all your tight construction ended up completely out of square after travel – you could even break windows with too much strain, so if in doubt, over-build when it comes to framing. Use flexible materials throughout – plywood instead of drywall, for instance, is how we created our white walls. Make sure all pipes and wires are properly strapped to joists/studs, so they don’t shift and connections don’t break. Make sure weight is evenly distributed within the house – balancing appliance location, for instance, so they are not all on the same side. 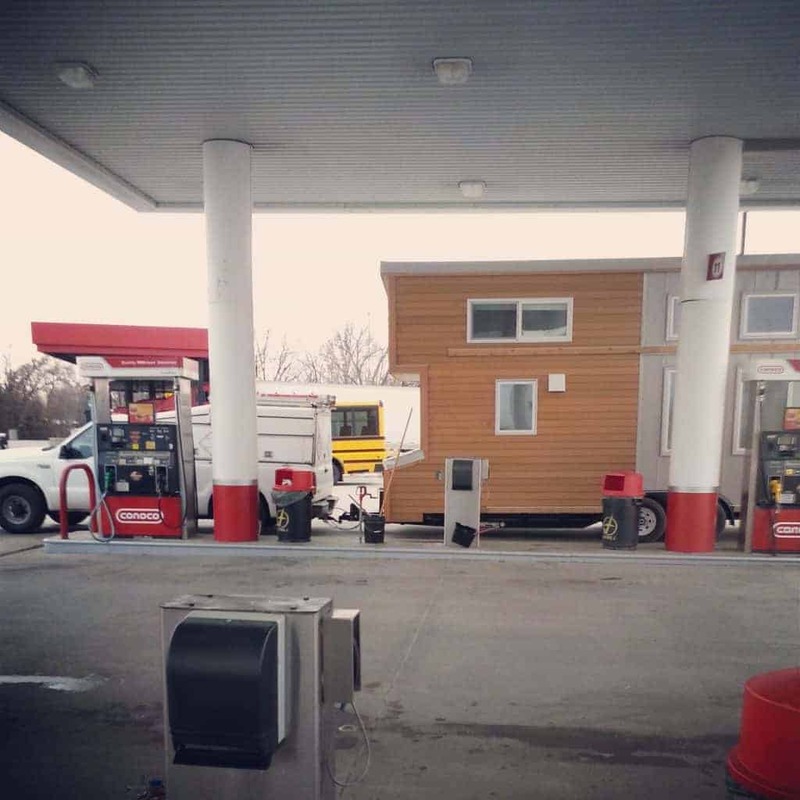 It’s extremely important that you adhere to maximum height and width requirements if you are going to travel down the interstate, pump gas, or really do any towing of your house at all. Your finished house from road level up must be no taller than 13.5 feet by law. Interstate signs, toll stations, gas stations, power lines, etc. are all set at a standard distance from the ground – in many cases at exactly 14 feet. That gives you as little as 6 inches of clearance! It took me a full week of travel to stop looking up as I crept slowly up to any covered gas pump, each time thinking the house wouldn’t fit. But build to a max of 13.5’ and you’ll be safe. That goes for the 8.5’ width limit as well. Every time we were passed on the freeway by a large double-trailer truck, with its rear trailer swaying to within inches of our precious house, we were ever so thankful that we did not build wider, as great as the temptation was to maximize indoor space. During our move state troopers or local police did not stop us once. Our house was not measured or weighed along the way. But just because you might be able to get away with it, doesn’t mean you’d ever want to. That reminds me – make sure your trailer is registered and has a visible license plate when you are traveling. Don’t give state troopers a reason to pull you over and start asking too many questions. Burn off excess propane in supply lines and turn off gas completely at the tank. That way, if a pipe starts leaking during travel, there won’t be any dangerous gas collecting inside the house. 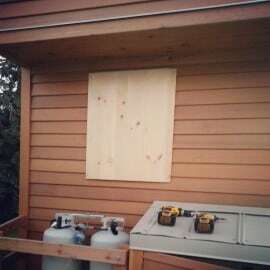 Cover the most vulnerable windows with plywood to protect from flying rocks or other debris on the road. Add extra weatherproofing on what will be the front of the house during travel (tongue side of trailer). Make sure all gaps in cladding are caulked. We even duct-taped over a few joints just as an extra layer of protection. We encountered rain, freezing rain and snow, and lots of dirt and dust during travel, each particle trying its hardest to work its way into the house. Bring an extra trailer tire with you. If your truck blows a tire, it’s likely not hard to find the right size replacement. Trailer tires are less common, and you should have a spare just in case. What else do you need for safe towing? A truck of course! (And a big one at that) A little research on towing capacity and power needs should lead you in the direction of a ¾ ton truck like a Ford F250 Super Duty or Chevy 2500, at a minimum. If you can get access to a 350/3500, all the better. Diesel is much better for towing than gas. 4WD is better than 2WD or AWD. Ultimately you want a truck that can, at minimum, tow 15000 lbs. safely and that has a large v8 or v10 engine. An F150 for example, may seem like it possesses enough power, but the suspension, cooling system and breaks are not designed for such heavy towing. Do careful research and make sure the truck you choose is more than you need, not less. What I ended up using landed somewhere in the middle, or even on the low end of this range. 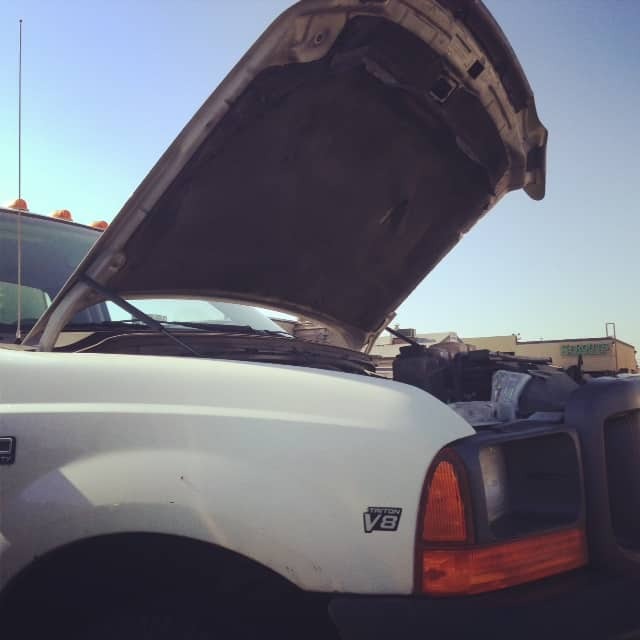 Needing a truck to haul materials during the building process, I chose to buy an inexpensive truck as opposed to renting something solely for the move. This limited me to older trucks, ones that I could afford to buy outright. I found a good deal in Denver on an F250 Super-Duty, which had a lot of miles, but was a solid truck, able to tow heavy loads safely. As it was, having to stay only a night in Modesto, CA we had a bike, camera, credit cards, passports, and other items stolen from the back of the truck. Major bummer! An unforeseen hurdle for sure but there just wasn’t anything we could do but roll with it. Only lesson there was to avoid the dreaded Central Valley of California. It’s known for its car theft. Luckily the house itself was left untouched! In retrospect, I would have spent a little more on a truck with fewer miles and perhaps a diesel engine for better towing over the long, slow climbs. Ani somehow captured this amazing image of us being passed by a Tumbleweed house somewhere in Arizona. During our move my girlfriend Anjali drove our other car as a follow vehicle. This way she couldn’t speed ahead too far ahead for me to catch up but also meant she could help direct traffic around the slow-moving house, help open up a lane for passing or pulling off the highway when it was needed, and could keep check for anything amiss as we rolled down the road. (She was also able to snap some great travel shots, the best being an image of a Tumbleweed house passing us in Arizona). She caught a few things of importance like when the trailer’s license plate almost fell off after being scraped by a steep dip pulling out of a gas station. And of course the second car was vital when the truck broke down in Modesto. Though not absolutely essential, I always felt safer with her behind me and I definitely recommend a follow vehicle when on a trip of this distance. Click her for Part Two of our tiny house towing adventure — We continue by discussing RV parks, weather concerns, and how we found a place to park! Unfortunately,i have a disagreement with you about tow vehicles. 4wd is not better than two wheel drive. Especially on 3/4 and 1ton trucks and above. You will burn the transfer case up if you try to run in 4wd at highway speeds for an extended period of time. 4wd is only designed for slow off road speeds in sand or wet and muddy conditions. And even then towing on a muddy road is highly unrecommended. But it would have its benefits in snowy weather at slow speeds in an as need basis. Also building wider would have been very cool as far as living space is concerened, but legally it would have been a logistical nightmare. Permits in every state for oversize load. With the addition of requiring a pilot car or two in some states. 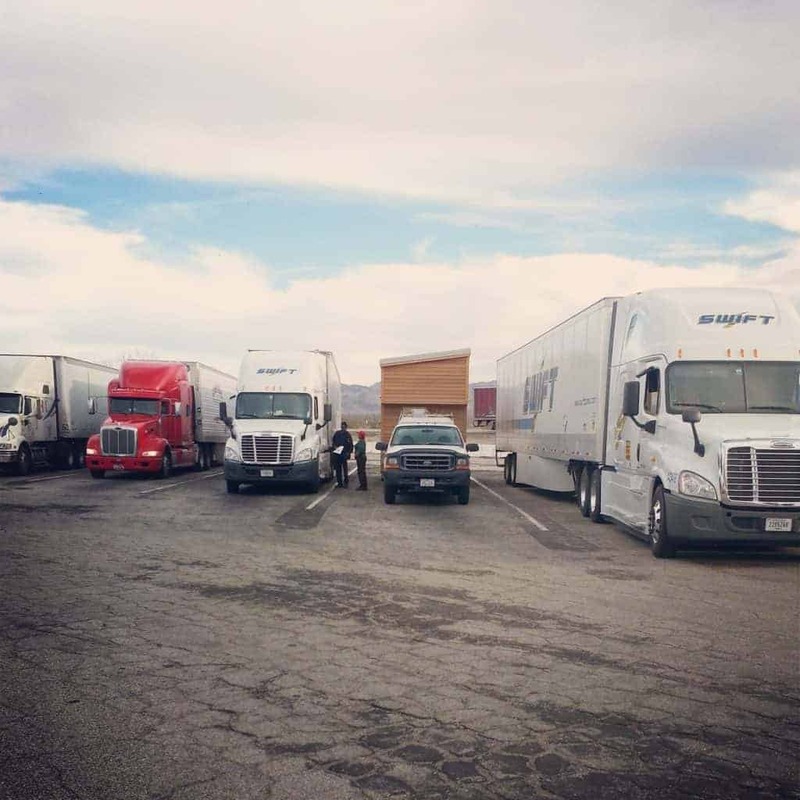 Great for trucking companies who specialize in this but not for the average person. 8.5 feet (102in) is the max width in every state including canda and mexico. Im glad yall made it but moving a house this house should not have been daunting at all. My concern would have been the quality of craftmanship and it holding up to highway speed winds and then some. But pulling it shouldnt. But i see that as far as your “tow vehicle” you found out you messed up but we all make mistakes. Thanks for helping others see it. I personally would have never bought a gas 3/4 or 1 ton ford ever. Very unreliable for towing. And never an automatic. Tranmussions burn out too easily if a person does not have amy experiance towing with an auto. You cannot drive it like a car when towing. You drive it like a truck. Slow acceleration and long deacceleration. Yes your right it needs to be tagged and lighted number one to be legal and number two so you dont get any tickets. Oh also trailer breaks are a must for anything over 10000lbs in every state. Minimum height in most states is 13ft 6 in. (From the ground to the top of the house on the trailer). Which is the normal height of the semi trucks everyone knows all too well rolling up and down the higheays. So anything over that is once again considered oversize. More permits and other hurdles. Texas, colorado, and nm i know for a fact is 14ft. But no reason the build over 13ft 6 in. I think your house is very neat and major cuddos for designing and building it yourself!! Hi. Lovely home. 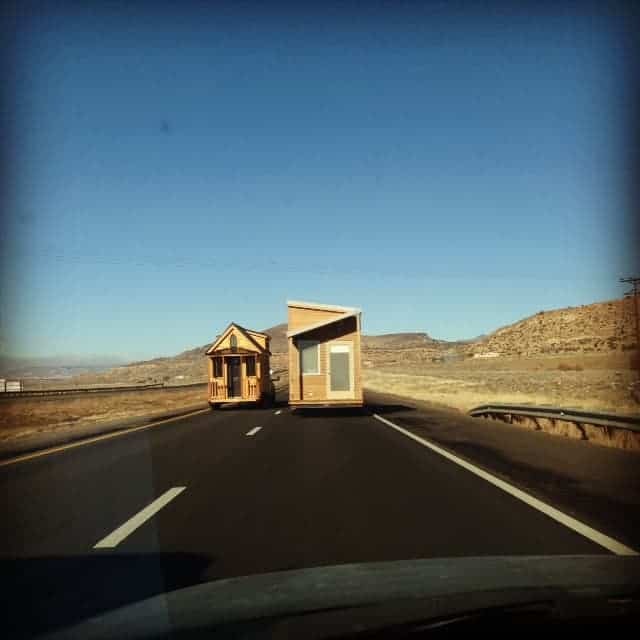 I was wondering how long is your tiny home and, what is the maximum length for a tiny home that can be pulled by a f-150. Thanks in advance for your response! My house is 20′. I would not recommend towing any but the very smallest tiny houses with an F150. That’s too small a truck unless your house is very, very light weight. You’ll definitely need at least an F250 or other 3/4 ton truck to safely tow it. It’s less about length and far more about weight. Hey Adam! I’m currently in planning stages of building my tiny home that is soon to be. I’m a semi-experienced builder, and have access to a full size wood shop with every tool possible and a large yard to build in. The catch? It’s over 10 hours from where I live most of the year. (Oddly enough, it’s also less than thirty minutes outside of Sebastopol, CA, which is where I grew up!) I’m planning on moving home early June, allowing 3.5 months to build it to the point of livability (cabinetry and some appliance instillation can wait) and then driving her up to Eugene, Oregon. I’m worried about the structural integrity of the framing on the drive. You mentioned to ‘Over-frame’ when building for long-distance travel — what’s the more detailed explanation for this? Did you use metal braces when connecting studs to baseplates? Do you wish you had, but didn’t?? I do love the idea of using plywood rather than drywall for interior siding, though! Mudding drywall is quite possibly one of my least favorite tasks ever. 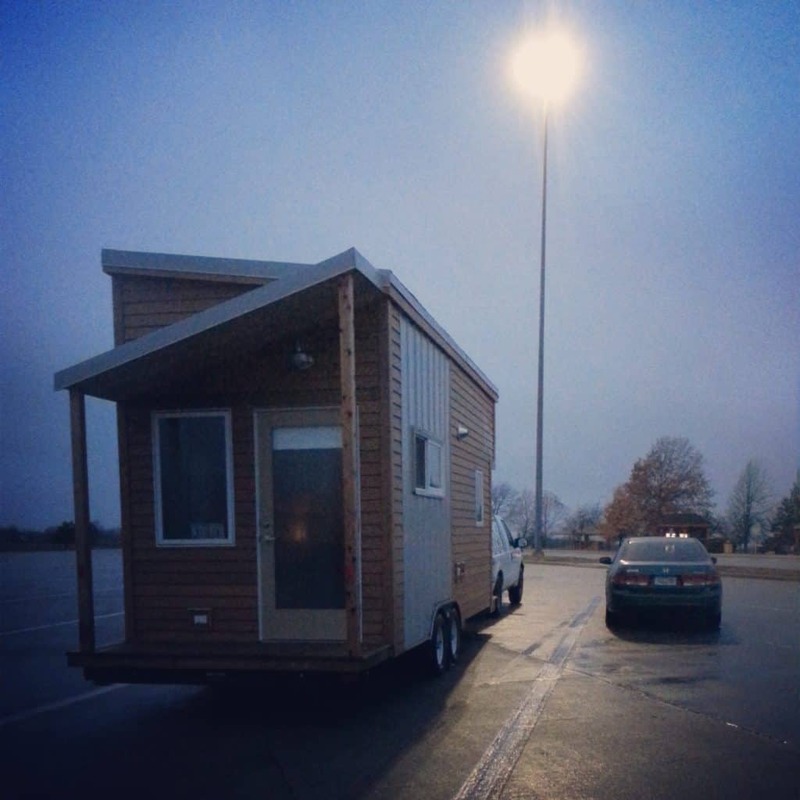 I’ve towed the Tiny Project house on two 2000 mile trips with no issues. The framing itself does not need to be overbuilt, but adding things like diagonal wind bracing is important to prevent wind shear while towing the house. By using plywood on both sides (sheathing and interior walls) — plus the added rigidity of closed-cell spray foam insulation — my walls are rock solid and experienced no movement or damage at all even during long travel. I did not use hardware to connect studs to baseplates, but I did use construction adhesive. I am about to order my custom trailer, but have come have one major question before I do so. Will a 28″ trailer be able to get back down my parents’ steep-graded driveway? Its pretty steep…Is it common to have issues with the rear of the house scrapping when going down steep hills? Is there anything I can do to prevent this? Thanks for your help! It’s really impossible to say without knowing exactly what the driveway is like, but I can tell you that 28′ will be hard to maneuver in most any situation. I’d strongly suggest downsizing to 24′ to make towing and positioning easier if and when you move. Thanks for sharing how you did this. I actually had a request recently to tow a tiny house and turned it down simply because I had no idea how to do it safely and effectively. Now I know. Tiny house towing really shouldn’t be any tougher than towing a full size mobile home… should it?